Pelops is a famous figure from Greek mythology, and he was named as one of the strongest and wealthiest of all the kings of Ancient Greece. The name of Pelops even lives on today for the Peloponnesus (Peloponnese peninsula) is named for this mythical king. Pelops though is not famous for his kingly characteristics, but is known for being a member of the House of Atreus, the most cursed family in Greek mythology. The curse placed upon the House of Atreus started before the time of Atreus himself, and was first brought down upon the family line by Tantalus. Tantalus was the son of Zeus, and would become the king of Sipylus, and by the nymph Dione, Tantalus would become father to Niobe, Broteas and Pelops. Tantalus was in a privileged position, and was privy to some of his father’s plan, this though made him conceited, and taken to exceeding the boundaries expected of mortals. On one occasion Tantalus even went as far as playing a “joke” upon the gods. Tantalus invited all of the gods of Mount Olympus to a fantastic banquet, and for some unknown reason, Tantalus decided that the main course would be made from the body parts of his own son Pelops. Thus Pelops was killed and cut up before being served to the gods. All bar Demeter, amongst the gods saw what Tantalus had done, and refused to eat, but Demeter was distracted, for her daughter Persephone had gone missing, and automatically took a bite from the meal in front of her. The gods would bring Pelops back to life, but one bone was missing, the shoulder having been consumed by Demeter, and so the goddess crafted a replacement bone from ivory. When Pelops was brought back to life he was an improved version of himself, for the work of the gods had made him more handsome than before. 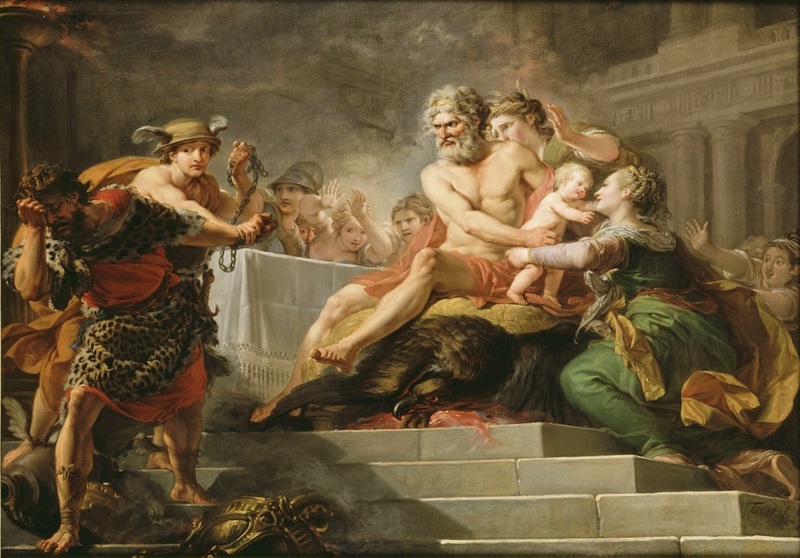 The actions of Tantalus was said to be the starting point for the curse placed upon the House of Atreus; and whilst ultimately Tantalus would be punished in Tartarus for eternity, his children would suffer also for Niobe would witness the slaughter of her children, and Broteas self-immolated. Pelops himself would leave Sipylus, and arrive at the kingdom of Oenomaus at Pisa (Greece). Some tales tell of his voluntary departure, whilst others tell of how he was forced out by the military endeavours of Ilus. Oenomaus was a king favoured by the god Ares, and the Olympian god has present Oenomaus with both weapons and horses. Oenomaus also had a beautiful daughter, Hippodameia. Pelops brought with him a great wealth, but this was not enough to convince Oenomaus to allow Pelops to marry Hippodameia, for an Oracle had told the king that any future son-in-law would kill Oenomaus. Oenomaus had devised a plan which would hopefully dissuade all potential suitors of Hippodameia, for the king proclaimed that only the first person to outrun his own chariot in a race to the Isthmus of Corinth would win his daughter’s hand. If though the suitor did not outrun his chariot then they would be killed, and their head placed upon a spike in front of the palace. A race against a chariot pulled by horses of Ares and potential death was not enough to dissuade all suitors though, and even before Pelops arrived 19 men had attempted the race, and of course 19 men had failed. Initially confident, Pelops became concerned when he saw the heads of those who had gone before upon their spikes. Deciding that he could not win by fair means, Pelops decided to cheat, and convinced Myrtilus, the king’s charioteer to assist him. Pelops was said to have promised Myrtilus half of the kingdom of Pisa, if he would help Pelops win the race. Some say it was not Pelops who did the conspiring but was Hippodameia herself, with the daughter of Oenomaus having fallen in love with the handsome Pelops. Myrtilus, when he set up Oenomaus’ chariot, did not put the lynchpins in place, and as Oenomaus raced the chariot of Pelops, so the chariot effectively fell to pieces, and Oenomaus was dragged to his death. Realising what Myrtilus had done, Oenomaus, with his dying breath, cursed his servant, proclaiming that Myrtilus would die at the hand of Pelops. Now Pelops himself found himself in a great position, for he could now wed Hippodameia, and with Oenomaus dead, he would have a kingdom to rule over. Pelops though soon realised that if he immediately gave Myrtilus half the kingdom, it would be obvious that King Oenomaus had not died by accident. To hide his part in regicide, Pelops instead decided to do away with his co-conspirator, and so Pelops through Myrtilus into the sea, the point where Myrtilus fell would become known as the Myrtoan Sea. Even as he fell though, Myrtilus himself had time to place a curse on his murderer, condemning the family line of Pelops to generations of strife. The curse itself had no immediate impact upon Pelops, for the new king of Pisa sought, and received, absolution for his crimes from the god Hephaestus. He also built a magnificent temple dedicated to Hermes, this Pelops did to avert the anger of the god, for Myrtilus was a mortal son of the messenger god. Pisa would flourish under Pelops, and the king would expand to take in new territory, including Olympia and Apia. This expanded area would be named Peloponnesus by Pelops. The prosperity of Pelops and his kingdom was helped in no small part because of the king’s planning. Firstly, Pelops married off his sister Niobe to King Amphion of Thebes, and so gained a powerful ally. Pelops then did likewise with many of his children, and Pelops had many children. Alcathous – Alcathous married the daughter of King Magareus of Onchestus, and would succeed his father-in-law to the throne. Atreus – Atreus would become king of Mycenae, and father of Agamemnon and Menelaus. Copreus- Copreus was exiled from Elis, but would gain favour in the court of his own nephew, King Eurystheus of Mycenae, where the son of Pelops would be the king’s herald. Eurydice – Eurydice would marry King Electryon a king of Tiryns and Mycenae, and via Alcmene would come grandmother of Heracles. Hippalcimus – Hippalcimus would become known as a named Greek hero, when the son of Pelops sailed on board to Argo with Jason and the other Argonauts. Hippasus – Hippasus was possibly the King of Pellene. Lysidice – Lysidice would marry Mestor. 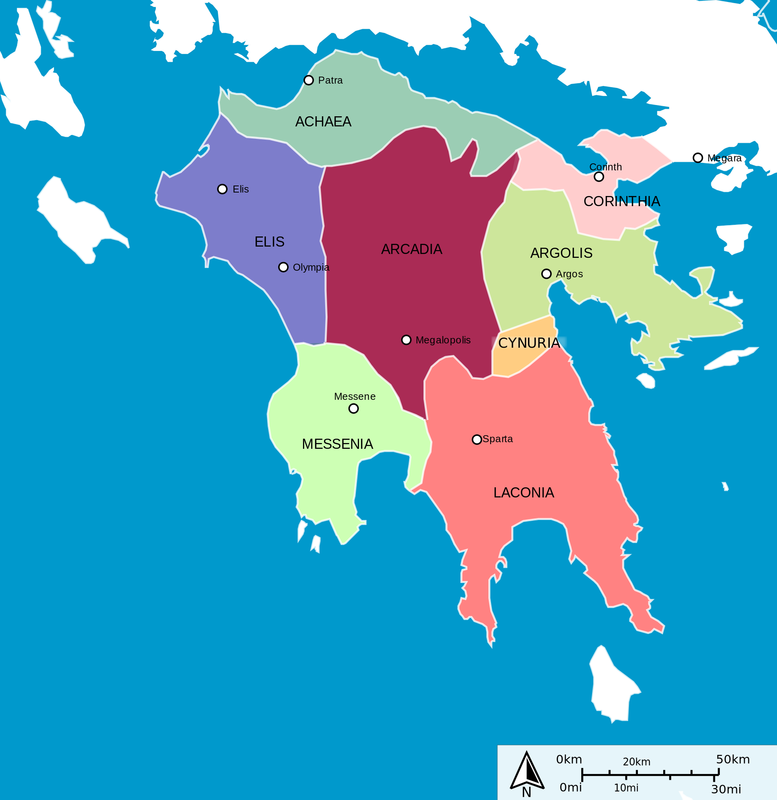 Mytilene – Mytilene would become a lover of Poseidon. Nicippe – Nicippe would marry the Mycenaean king Sthenelus, and give birth to the future king Eurystheus. Pittheus – Pittheus would become the king of Anthea, and then a new city, Troezen, and via Aethra, would become grandfather to Theseus. Thyestes – Thyestes would become the king of Mycenae, although he would be locked in a lifelong conflict with Atreus. Troezen – Troezen would become king of Hyperea at the same time Pittheus became king of Anthea, when Troezen died, the two cities were joined together as Troezen. Chrysippus – Chrysippus was the only named child not born to Hippodaemia, but this son of Pelops was considered the favourite child. Despite being “illegitimate”, Chrysippus was considered to be the favourite son of Pelops, and Hippodameia was said to fear the possibility that her own sons would be overlooked when it came to inheriting from their father. At one time Chrysippus was abducted by Laius, the father of Oedipus, who had fallen in love with the son of Pelops, but Chrysippus was rescued and returned to his father’s palace, although the favoured son of the king would find no safety there. Various stories tell of how Chrysippus came to die, although in all probability he was killed by either Atreus or Hippodameia. Pelops though suspected all of his sons for taking a role in the murder of Chrysippus and they were sent away to different points of the Peloponnesus, and many actually flourished. Hippodameia also feared the wrath of Pelops, and fled to Midea. The murder of Chrysippus was said to have further perpetuated the curse on the family line. There is no mention in ancient texts about the death of Pelops, but it was though that when he did die his bones were laid to rest near Pisa, for his sarcophagus was to be found near the temple of Artemis. The bones of Pelops would continue to be important in Greek mythology, and the divinely made shoulder bone of Pelops would be find further mention. Firstly, one of the conditions to allow the victory of the Achaeans at Troy was said to be that the bone of Pelops be present amongst the Greeks. Thus, Agamemnon dispatched a ship to bring it from Pisa; unfortunately, the ship and its precious cargo were subsequently lost during a storm off the coast of Eretria. Then, years later, the ivory bone of Pelops was dredged up form the depths by the net of a fisherman called Demarmenus. Demarmenus took the bone to Delphi in order that he should find out what he to do with it; coincidentally a committee from Elis was also present at Delphi as they sought guidance about a plague ravaging their state. The two parties were brought together by the Pythia, and so the bone of Pelops returned to Pelop’s homeland. Demarnenus was given the honoured position as guardian of the bone, and the plague rampaging through Elis abated.